This algorithm finds a point for placement of an icon (or a label) which is guaranteed to be inside of a polygon and somewhere towards the center of the figure. As input the algorithm only requires the vertices as an ordered list. For every vertex we find a point halfway inside the polygon. We then create an imaginary point "linepoint" along this line, so that we have two coordinate pairs to work with when finding intersections. This can be done with x = x + cos(angle), y = y + sin(angle). The next step is then to find all intersections between the line vertex-linepoint and the edges of the polygon. 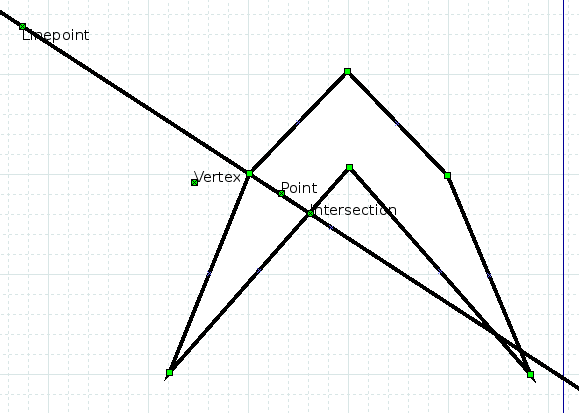 We need to have a total count of intersections in at least one direction from vertex to determine which way points towards the inside of the polygon (ray-casting point in polygon algorithm). We also need the closest edge in that direction. To handle polygons with holes we just include the hole-polygons in the list of edges we check against. Now we can finally calculate the point by taking the nearest intersection point in the right direction (looking at intersectioncount to find out which direction) and getting the point halfway between vertex and the intersection. Now we use the points halfway inside the polygons to find a point to place the icon. This part of the algorithm could do with some work, I have ideas for several approaches that should be tested on various polygons to find the best one. 14:31 < SpeedEvil> I think just 'don't place on a point where the points line is under 30% of the max' is probably reasonable. When calculating points we have the distance between intersectionpoint and vertex. Perhaps this could somehow be used to detect polygons with several big parts and this "bridges" between them?